Who Discovered Why The Challenger Exploded? The history I learned about the 1986 Challenger accident investigation was wrong. I stumbled across the real story while researching famous accidents, for an article I published on the MongoDB Engineering Blog about a mistake I made: “When Switching Projects, Check your Assumptions or Risk Disaster”. In the article, I wanted to compare my mistake to the NASA engineers’ mistake, and of course I referred to Richard Feynman’s televised demonstration that the Challenger had exploded because its O-rings got stiff when they were cold. But it wasn’t Feynman’s discovery. It was Sally Ride’s. One day Sally Ride and I were walking together. She was on my right side and was looking straight ahead. She opened up her notebook and with her left hand, still looking straight ahead, gave me a piece of paper. Didn’t say a single word. I look at the piece of paper. It’s a NASA document. It’s got two columns on it. The first column is temperature, the second column is resiliency of O-rings as a function of temperature. It shows that they get stiff when it gets cold. Sally and I were really good buddies. She figured she could trust me to give me that piece of paper and not implicate her or the people at NASA who gave it to her, because they could all get fired. Kutyna passed on the tip to Feynman, and Feynman’s showy demonstration broke open the investigation and made the nightly news. Kutyna kept Ride’s secret until after she died in 2012. All the while, Richard Feynman has been glorified as the hero of the story—that’s how he seemed to me when I was a teenager, and it elevated by another mile the pedestal on which I placed him. Even now that I know the truth, I still think of the episode as a story about Feynman, and I unthinkingly illustrated my article with a photo of him doing his magic trick with the ice water. 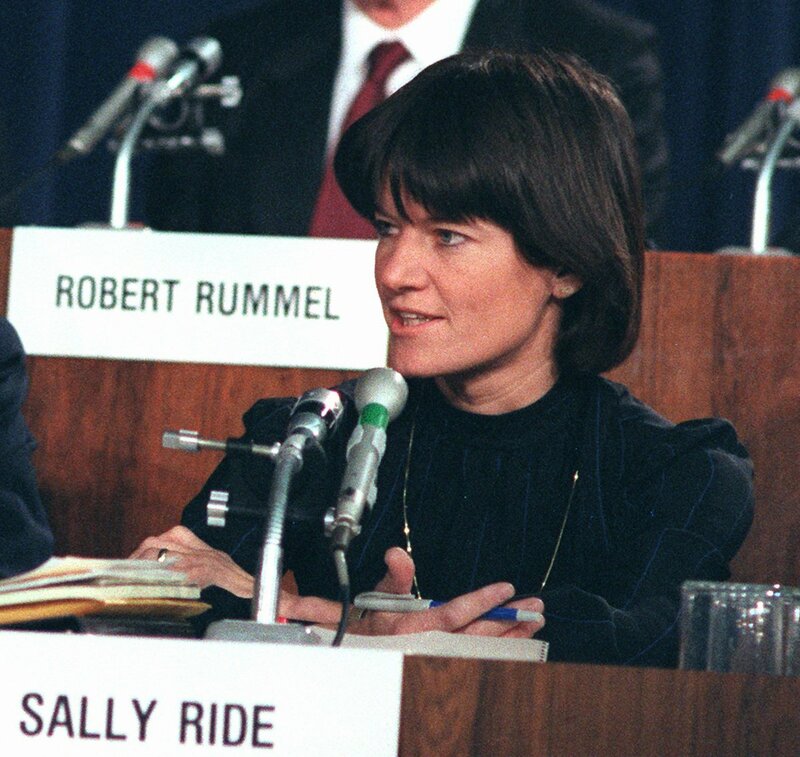 Sally Ride speaking at the presidential commission investigating the Challenger accident. Charles Tasnadi/AP.